and his early verse celebrations of Chicago, Illinois. Carl August Sandburg was born in Galesburg, Illinois, on January 6, 1878, the second of August Sandburg and Clara Mathilda Anderson's seven children. His parents had both come to the United States from Sweden; his father worked as a blacksmith's assistant. Sandburg liked to read and decided at age six that he wanted to be a writer, but he left school after finishing eighth grade to work at a series of jobs. Sandburg was brought up in a largely Republican household, but events such as the local railway workers' strikes and the Chicago Haymarket riots of 1886 got him interested in social justice. Sandburg traveled extensively through the West, where he began developing a love of the country and its people. Following eight months of service in the army, Sandburg entered Lombard (now Knox) College in Galesburg. There he wrote his first poetry and was encouraged by Professor Philip Green Wright, who privately published several volumes of his poems and essays. Sandburg left Lombard without graduating and eventually moved to Milwaukee, Wisconsin, where in 1907 and 1908 he was district organizer for the Social Democratic Party in the state. In 1907 he met Lilian Steichen, a schoolteacher, and they were married in 1908. From 1910 to 1912 Sandburg served as secretary to Milwaukee's Socialist (believing in collective ownership of the means of producing goods and services) mayor Emil Seidel. Later he moved to Chicago, becoming an editorial writer for the Daily News in 1917. Meanwhile his verse began appearing in Poetry magazine; Chicago Poems was published in 1916. He made his reputation as a poet of the American scene with Cornhuskers (1918), Smoke and Steel (1920), and Slabs of the Sunburnt West (1922). Sandburg's early writings dealt with his belief in social justice and equality and were written in such a way that they barely resembled what most people thought of as poetry. "I Am the People, the Mob" from the Chicago Poems is an example. The ending of the poem is similar to the style of Walt Whitman (1819–1892): "When I, the People, learn to remember, when I, the People, use the lessons of yesterday and no longer forget who robbed me last year, who played me for a fool—then there will be no speaker in all the world say the name: 'The People,' with any fleck of a sneer in his voice or any far-off smile of derision [ridicule]. The mob—the crowd—the mass—will arrive then." Sandburg's early poetry not only tended toward unshaped imitation of real life but also copied other poets as well. Sandburg's "Happiness" is somewhat similar to Ezra Pound's (1885–1972) "Salutation," and Sandburg's "Fog" was compared to T. S. Eliot's (1888–1965) "The Love Song of J. Alfred Prufrock," which had appeared the year before "Fog" was published. Seventy-three previously uncollected Sandburg poems from the 1910s can be found in Poems for the People (1999). From 1926 to 1939 Sandburg devoted himself mainly to writing the six-volume biography of President Abraham Lincoln, presenting Lincoln as a symbol of the American spirit; Sandburg received a Pulitzer Prize in history for this work (1939). He also collected the folk songs that made up The American Songbook (1927). Honey and Salt (1963), a remarkable achievement for a "part-time" poet in his eighties, contains much of Sandburg's best poetry. Here the mellowness and wisdom of age are evident, and the poems are more effective than his earlier verse. By this time Sandburg had developed and begun to express a deeply felt sympathy and concern for actual people. Tenderness replaces sentimentality; controlled feelings replace defensive "toughness." There is also a religious element in these last poems that does not appear in Sandburg's earlier work. 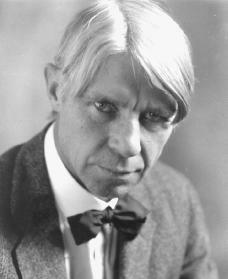 Sandburg also collected folk songs and toured the country singing his favorites. He published a collection of these songs, called The American Songbag. Other Sandburg works include a collection of children's stories, Rootabaga Stories (1922); Good Morning, America (1928); The People, Yes (1936); Collected Poems (1950), which won a Pulitzer Prize; and Harvest Poems, 1910–1960 (1960). Remembrance Rock (1948), a sweeping view of American history, was his only novel. Sandburg died in Flat Rock, North Carolina, on July 22, 1967. Golden, Harry L. Carl Sandburg. Cleveland: World Publishing, 1961. Reprint, Urbana: University of Illinois Press, 1988. Meltzer, Milton. Carl Sandburg: A Biography. Brookfield, CT: Twenty-First Century Books, 1999. Niven, Penelope. Carl Sandburg: A Biography. New York: C. Scribner's Sons, 1991. Yannella, Philip R. The Other Carl Sandburg. Jackson: University Press of Mississippi, 1996.